GAME OF DEATH MOVIE POSTER BRUCE LEE ROLLED ORIGINAL ONE SHEET. The 1979 Robert Clouse kung fu martial arts action thriller Bruce Lee challenges the underworld to a game of death. 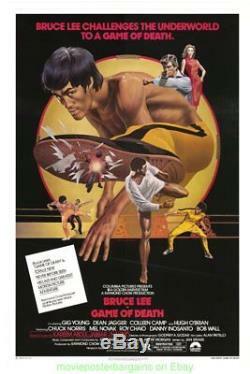 ; made after the untimely death of Bruce Lee, featuring fight scenes he had already filmed strung together with scenes filmed using stunt doubles starring Bruce Lee, Gig Young, Dean Jagger, Chuck Norris, and Kareem Abdul-Jabbar. I don't sell unlicensed reprints, especially by misrepresenting them as original , all auctions are for theatrical distribution studio issued one sheet size 27 by 40 inch original movie posters unless otherwise noted. THE SHERLOCK HOLMES I SENT WASN'T THE ONE THAT HAS HOLMES FOR THE HOLIDAY'S TAG LINE ON IT HE WANTED. I GUARANTEE THE ARTWORK MATCHES THE PHOTO BUT NOT EVERY NUANCE BETWEEN THESE VARIOUS PRINT RUNS THAT THE STUDIO'S PUT OUT - SO THE PHOTO WILL CORRECTLY MATCH THE POSTER'S ARTWORK YOU RECIEVE BUT MAY HAVE A DIFFERENCE IN THE TYPE ON IT. More than just a pretty picture. Make your listings stand out with FREE Vendio custom templates! FREE scheduling, supersized images and templates. Over 100,000,000 served. Get FREE counters from Vendio today! The item "GAME OF DEATH MOVIE POSTER 27x41 BRUCE LEE RARE ROLLED ORIGINAL ONE SHEET" is in sale since Monday, May 21, 2018. This item is in the category "Entertainment Memorabilia\Movie Memorabilia\Posters\Originals-United States\1970-79". The seller is "movieposterbargains" and is located in Pasadena, CA. This item can be shipped worldwide.